I have been pondering Pauline Cushman the last few days. Like so many of us, she started out in life with a burning passion to chase adventure. Unfortunately, she let the flame go out when life couldn’t keep delivering excitement and applause. She did not transition well from living in vivid color to fading away like an old photograph. But it was her choice. Young Pauline was a woman of fire and drive. Born in 1833, she started acting sometime in the early 1850’s. Love and marriage pulled her away from the stage for a time, however. But when her husband, a volunteer in the Ohio 41st Infantry, died of dysentery, leaving her with two small children, she went back to the only profession she’d known. While performing in Louisville in 1862, a Southern sympathizer offered her $300 to toast Jefferson Davis from the stage. Pauline not only saw the chance to make a substantial amount of cash, but also the opportunity to go on a patriotic adventure. She cleared the salute with the Union Provost Marshal, made the toast, and was promptly fired by the theater. Opportunity quickly presented itself for Pauline to use her good looks and acting skills to spy for the north. While she was able to pass some information on to the Union, her career was short-lived. Pauline was arrested in Louisville by the Confederate General Braxton Bragg and sentenced to hang. Her time awaiting the sentence in a dark, damp cell took a serious toll on her health. Though Pauline escaped the gallows when the city fell to the Union (with only three days to go before her execution), her constitution never recovered. Still, at the end of the war, her spirits were high and Pauline was the belle of the ball for her daring-do. For a time she toured the country sharing exciting stories about her days as a spy. 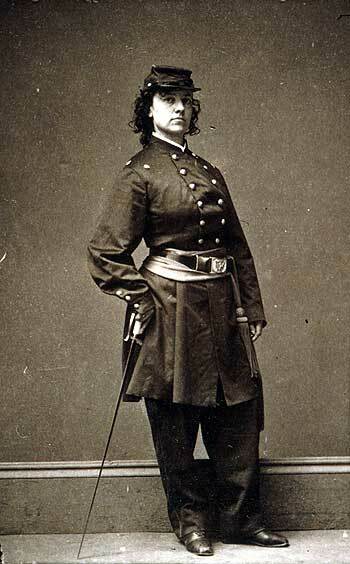 President Lincoln even made her an honorary major, uniform and all. Eventually, she married again and returned to the theater. But the public had moved on and Pauline was a has-been before she was ever really a star. She divorced and re-married, but drug dependency, her fading star, and bouts of depression haunted her. Pauline died alone of a drug overdose in a seedy boarding house in San Francisco. She was only sixty years old. The Bible says we are called to such a time as this. When that time is done, we have to find joy in other things, not lament the loss of praise, adrenaline, or applause. I can’t help thinking that if Pauline had done that, she would have died surrounded by friends and family with a smile on her face. Not every lady is A Lady in Defiance. But I believe how we wind up is our choice.